I’ve been wrestling with some big concepts over the last couple of months related to life. Obviously working with a new company and going through change makes you evaluate things, but I think there is something bigger at work. The 5280 Fellowship program has helped to challenge some of my thinking when it comes to calling and career. While my thoughts below are a work in progress, I have finally settled in on a few definitions that seem to make sense to me. Calling. Your calling isn’t what you do, it’s who you are. If you have ever taken an EQI or Myers Briggs test, you understand that all of us are hard-wired with certain strengths and viewpoints. While some people are gifted with analytic capabilities, others are gifted with more social/emotional views and empathy. Others show signs of leadership and big-picture views. Whatever your strengths, these all add up to make you who you are. Calling is simply tapping into these strengths and using them in everyday life. Profession. You can use your calling in ANY profession. Calling is not synonymous with profession, although profession can support calling. Since your calling is leveraging your strengths, you can use those strengths in ANY organization or profession. Professions many times are just a knowledge base that specify a role or function within an organizational environment. Platform. This is your position of maximum impact where your calling is leveraged in your profession or life. I met with a colleague several weeks ago and he asked me if I ever considered doing something different or working in another industry. I told him that I have considered it many times in the past. I’ve been interested in sports marketing for a number of years, but while I think I’d love that industry, it would require starting over again from the bottom and building up that professional knowledge base. Given that I’ve been working in the AEC environment for 21 years now, my professional network and industry understanding allow me to operate with efficiency and provide greater value to the organizations I work for. Committing to the field I am in now allows me the ability to have a high platform to use my calling in my profession. For this reason, I am going to stay in my current field and work to be a knowledge expert as my calling comes to fruit. God’s will. God’s will has more to do with restoration and the fruits we all know as holy, than it has to do with a linear ‘perfect path’ of decisions and profession. About 10-or-so years ago, I had lunch with an architect friend and mentor of mine. He had been practicing architecture his whole life and owned his own firm. He was also a leader in a small little church I went to and I wanted to pick his brain about my career. I went on to tell him how unhappy I was with my current situation at work and asked him where he thought God wanted to lead me. I told him that I had two other job offers on the table and I needed discernment on where God wanted me. I admit that I was a little frustrated with his response as I was looking for some discernment as to what he felt God’s will was for my decision. What I’ve come to realize as I’ve matured in my profession is that he was really saying, “God has given you the FREEDOM to choose.” If my calling is truly separate from my profession, I can use my calling in ANY job. Career decisions are tough and I understand that we must continue to pray and ask for guidance as we move about our world. What can be truly freeing however is realizing that our true calling can be used in any area of life and in any career. At the same time, I believe that we should work towards professions and jobs that give us the biggest platform to impact our world. That is where our calling can be most effective. What about you? Are you leveraging your calling? Comments and observations welcome in the comments! Micah, what do you want to be when you grow up? I love the conversations I have with Micah. It is refreshing to see the world through his unjaded eyes and to get a glimpse into a soul where the whole world is ahead and dreams are alive with vivid color. Thinking back to my own childhood, I answered that same question several times. A fireman, a doctor, a jet pilot, an architect, and a surfer were just a few of my dream professions. What child would have said ‘a director of business development and marketing’ anyway? Outside of my lofty career goals, I strived through my youth to latch on to other activities to define who I was as a person. In junior high, most everyone is defined by some sort of activity. The jocks, the cheerleaders, the stoners, the nerds were just a few groups. As we all looked to find our place, I locked on to what I thought the coolest people in school were…the skaters. I loved skateboarding from an early age. I was fascinated with surfing as a small kid, and living in Colorado, skateboarding was the next best thing. Skateboarders were counter-culture but still friends with all the other social groups. They did cool tricks and had cool hair. That’s what I wanted to be. I was a skateboarder through junior high and transitioned to being a snowboarder in high school and college. I moved to California and became a surfer, and then became a triathlete. When being a triathlete wasn’t doing it for me anymore, I became a competitive cyclist, shaved my legs and started racing with 200 other shaved legged adult males. I moved to Colorado and became a runner, no… a trail runner, no…an ultra-runner…well…you get the idea. Through all my various ‘identities’ I’ve had over the years, one place I have struggled is latching on to what it means to have an identity in Christ. What does it mean to be a ‘Christian’? It seems like such a small thing, but one area that I have struggled with is the stigma of some other Christian people and not wanting to be put in the same bucket as them. From the people holding up “You’re going to Hell” signs at football games to a few encounters with other Christians I have known over the years, I have struggled with embracing the identity. But God is showing me something different. Hypocrisy and imperfection are results of the broken human condition. All of us have sinned, and part of my problem was putting too much stock in other people – specifically ‘Christians’- to do it right. I know full-well the extent of my own sin, and thank God for the grace He gives to cover it. Grace I should extend to others as well. Having an identity in Christ means that I am a work in progress. I am an imperfect person pursuing a perfect God, and that’s okay. I have an opportunity to learn from my own past experiences and try and show the grace of Christ where I feel others have fallen short. Just because another person identifies with the title of ‘Christian’ and preaches hate does not mean I am like that person. It is like someone that calls themselves a runner but sits on the couch all day, eats junk food and does one 5K per year. That person can claim the title, but their actions don’t reflect the identity. I’m starting to ‘own’ my identity and have more confidence in bearing the image of Christ, and that’s a good thing. I can be defined by what I do by being selfless, showing love, and embracing truth. I’m not perfect by the world’s standards, but thanks to grace, in God’s eyes I am. It’s pretty liberating and I’m humbled to be called a ‘Christian’. I’m an imperfect person pursuing a perfect God who loves us. So next time someone asks me what I want to be when I grow up my answer is, “I’m a Christian, regardless of what I do professionally or recreationally, that’s all that matters most.” My prayer is that my son can say the same thing someday. Since I work in marketing, I am always working in a strategic mindset trying to determine ways for my firm to position to win more work. My job is to dig pass the issues or the surface level project at hand to uncover the real reason the client wants or needs to move their project forward. In other words, “what are the project drivers?” “Why are they doing what they are doing? The answer could be anything from aging infrastructure they are worried about; to new regulations they have to meet. 100% of the time, there is a REASON they are looking for a consultant to assist them with the project. My job is to find that reason, and help position my firm to be the best team to address that driver. As I headed into the office this past week, I was thinking about one of these project pursuits and my brain shifted gears to think about my own personal drivers. Why do I do what I do? What drives me to want to work out all the time? What drives me to work long hours at times and sacrifice personal time? What drives me to buy a cup of coffee for the guy behind me in line at Starbucks? What drives me to want to spend quality time with my family? It is not an easy answer or even a uniform answer for all of my actions, but there is always a driver. Sometimes it is a driver of selfish ambition or a competitive desire to just win, get ahead or climb on top. Other times, I am driven by love and just a pure selfless desire to help, serve and bless those around me. The one thing I recognize is the pure conflict within my soul to want to do good and to fulfill my own desires. I’m not saying it is bad to be competitive or want to get ahead. I am saying however that it is bad if it is ‘driven’ from the wrong place. Are we using those passions to bless others? Are we humble in our ambitions? As the holiday season is upon us and we reflect on the blessings we have been given, let’s take the time to examine our hearts. What drivers will you feed this season? Why are you doing what you are doing? Step outside yourself for a moment and feed the good wolf. The world will be a better place for it, and God’s love will shine through. 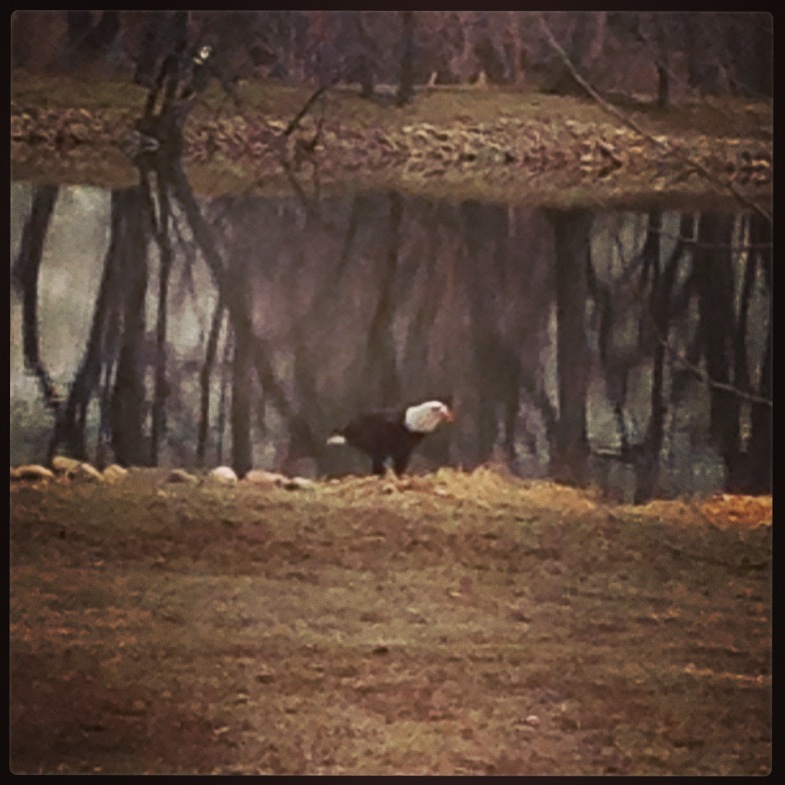 It was a little over a year ago when I saw my first bald eagle. It soared high above our car in Ohio as we drove to the hospital for Micah’s birth. I don’t know why I am so enamored with those birds, but they are one of the most amazing things to gaze at. Powerful and beautiful birds. This week has been a tough week for many people very close to me. I had a friend call me on Monday to tell me his daughter had passed away. My mother emailed me on Tuesday to let me know that the doctors would have to do more cancer testing and her blood work was alarming. On Wednesday I got news that a company I had previously worked hard to build was rashly sold and was falling apart at the seams. To top it all off, another friend of mine called Wednesday to let me know he was diagnosed with thyroid cancer and he asked me to pray. My heart is breaking in two for the pain and suffering that is infecting those close to me. I don’t know how it will be OK. I don’t know if it will be in this life or the next, but it will be OK. That’s the promise God has given us. The one thing I have learned through this life is that being OK is not absent of pain. That’s a hard truth to come to terms with, but through the painful moments we appreciate the joyful moments that much more. To all my friends in this life, whether you are in an easy or difficult place, know that God is there to support you. While he sometimes soars above us looking out, sometimes he lands next to the lake at our level to show us he cares and is still there. He is our bald eagle. I hate being sick. If catching the seasonal head cold isn’t bad enough, having to stay at home all day curled up drinking green tea and watching daytime TV is enough to make anyone go mad. One thing for sure, I have plenty of motivation to get back to work after channel surfing for 18 hours. Posting my self-loathing sickness status update on Facebook, I had a number of friends write comments back to me ranging from ‘get well soon’ to ‘hey, don’t forget Oprah comes on at 4’. Gotta love my friends. Sitting there bored with nothing better to do, I thought I’d flip the channel to Oprah, take a photo with my phone of the TV and text it to my buddy to let him know his girlfriend was on. Everything went according to plan, except my plans to flip the channel back to the other less-than-engaging show I was watching. Oprah had me roped in. Now I have never in my life watched an episode of Oprah all the way through, but there are firsts for everything. Oprah had a show on vegan diets, where our meat comes from, and the health benefits of eating vegan. It was fascinating to see the process that our food goes through before it gets to your table. Humans consume over 9 billion animals a year and seldom do we ask the questions where our food comes from or what we are putting in our bodies. Now I was not shocked by the process of butchering cattle, nor was it inhumane enough for me to swear it off as evil, but it was eye-opening to observe it on camera. Cattle are raised like crops, harvested like crops and eventually they get to your table. There was a lady on the show who had written a book about being a vegan that was the ‘expert’ on the topic. I thought it ironic that she was not a nutritionist, but a proclaimed ‘lover of animals’ wanting to live in harmony with all life forms (except plants of course). Various people on the show took a challenge to eat vegan for a week and most felt better physically after the week was done. As an athlete, I hear about every sort of diet you can imagine and how they are all good for you somehow. All natural, gluten-free, no meat, all meat, vegetarian, vegan, low-fat, high-fat, low sugar, etc. What I don’t think people often realize is that the one thing in common with all diets is that people are PAYING ATTENTION to what they are eating. When you are paying attention, you typically consume less bad stuff and more good stuff. You don’t eat as much and you feel better. Oprah brought up the needed realization of where our food comes from. As believers, our food that we live on should come from a spiritual source. When we stop paying attention to the source of our food, we start living in the world, worrying with the world, and we get tangled up in the world’s drama. When we are living according to a higher purpose, we are getting our food, our advice, and our power to live from a place that allows us to rise above it all. The key to it all is once again PAYING ATTENTION to what we are eating. Am I eating too much TV, talking too much gossip, and spending too much time listening to negative people? Or am I eating up the promises and love that God has given us through his word and relationships with others. Am I taking nutrition advice from human sources and not listening to God Himself? I do know that when I am PAYING ATTENTION I feel better. And man, I love feeling better…. In my short business career, I have been fortunate enough to help lead several different companies and organizations to success. Obviously the definition of success varies depending on who you talk to, but I truly believe God has given me a gift of being able to see a collective picture, and lead a group of people to the destination. The one thing that I have seen through my experiences is that success is highly dependent on the people who are involved to help reach the goal. We have seen situations time and time again where the most qualified group of people are not always the most successful as a team. Different opinions, finger-pointing, and ego often get in the way of developing a culture of success. Without a strong foundation of goals and principles that everyone buys into, organizations will fail every time.. I recently received an e-mail from a friend of mine that is struggling spiritually. He “does not always agree with Christians”, and it offends him a little to hear someone else tell him what they think is right or wrong, and so on. He loves Christianity though. He is painting the picture of the Church. Often times Christians are so caught up in the debate over Theology or gossip that we forget that we are one organization that is reaching for a common goal. I disassociated from the church when I was in my late teens for the same reasons. Judgmental people, legalism, differing opinions, etc. It was much easier to live life on my own terms then to deal with that crap. While this seems like the easiest avenue, it is also the perfect situation for the enemy of our souls. It is easier for him to conquer one person than it is to destroy an army. Just like the way I work with organizations to build success, it is a team of people that gets us across the goal line. I could go at it alone, but it would be a much harder fight. In the same way, the battle we fight as believers is to pull together as one. It is a hard-fought reality to know that God has called us into relationship with Him, with other believers, and into a life where we no longer live for ourselves especially when we don’t always agree with our teammates. It’s not the easy road, but God knows what it takes to build a successful organization called ‘His Church’. We must put aside the drama, train for success and read The Bible which is our rulebook. I have been praying frequently for my friend as he is a powerful and dynamic leader that given the right opportunity would bring a lot more people to the Faith. I pray that God will show him the true spiritual impact he could have in this world if he was able to carve out his time to get plugged in to the community of believers. I pray that just as God did for me a few years ago, that my friend would be able to see past himself, past the people, and understand the urgency of God’s calling to be connected. Working as a part of a bigger team, we could really evoke some change together. Those prayers also reflect my own personal prayers. I still have to constantly work to lay aside my own opinions and biases towards the religious egos, and ask God to work in my heart through His Word. When I disagree with people regarding Theology, I strive to understand why I disagree and have that opinion be grounded in Biblical truth without passing judgment. I have to force myself to go to church sometimes if for no other reason than to stay plugged in. I know it is God’s calling. Hopefully I can be a valuable asset to His Kingdom while I live here on Earth and bring more of His people together to focus on what matters. Let’s build a successful team.